I just de-comaed so numbers don't really make sense yet. But yay 50,000! Opiboble wrote: And incase no one noticed the sub text has changed again. It's okay, we forgive you. Oh, so this is how it goes, huh? Last edited by BlitzGirl on Fri Jul 26, 2013 4:24 pm UTC, edited 1 time in total. I did the raw data analysis of word frequencies in 50 page groups for page 1 through 1200, only to only then discover that I couldn't figure out how to put it in an interesting-looking graph. As I molpy down for the night, I leave this prediction: that the alt text will change to "it" either next newpix (if we jump straight to a zoom out) or at the end of a zoomout sequence (if GLR spreads the zoom over multiple newpix), showing the new and massively detailed area in which the 40 find themselves, complete with a ruined castle of their very own. And thus will end Time. ETA: The thread of time has passed 50,000 posts! Amazing! This. This! A thousand times this!! I wonder if Cueball is saying "Wow" for the trees or for something else off-frame that we can't see this newpix? I just got a message from one of our blitzers! BlitzGirl wrote: Quest progress: 77 out of 223 pages. 3 pretty neat, and bigger than it looked - your quest, the thread, and all! Thanks, Marsh'n! Did you notice that the title text has changed? Oh, you're a long way from that yet. But one dip, you will notice! You know, I was just thinking that the in-rushing sea/ocean would be a good metaphor for cancer... or a baby... or se(a)men. I don't see coffee, though. Has anyone noticed the Wiki yet? that the OTT has already figured out. Did we ever figure out why the sea is rising in the first place?? fhorn wrote: (Stopped studying math in HS when it conflicted with Music Theory. Can we discuss the Circle of Fifths instead, mebbe? I studied maths in university and the quickest way to make me feel like an illiterate idiot is to use a lot of music theory terms. I only know what was in GEB, Euler's letters to a princess, Leon Harkleroad's 'The Math Behind the Music', and Vi Hart's videos, and I didn't completely understand those since I still only had a vague hypothesis (involving group theory) about what the apparently-too-basic-to-explain terms meant. But just recently I listened to an introductory music theory audiobook, the kind that actually goes some way towards explaining the words used to explain the most basic musical concepts, and I realised that (as I had suspected) all these fancy terms defined in terms of each other, they're just mathematics. With a whole lot of ordinal numbers that sound like they're fractions but have nothing to do with the actual ratios of frequencies, just to throw us off the trail. And you know what? The circle of fifths is just a cyclic group of order 12 (involving multiples of approximately 4/3), described in an overcomplicated way. You hear me? You're doing maths, you are! You're just expressing the beauty of mathematics in sound! I was also hoping that Cueball and Megan would get a little more private time ( ), but nooooo. Maybe Randall is just messing with us? Could all this be some sort of...nerd-sniping game? ucim wrote: Do the Cuegan know how high up they are, or where they are with respect to safe ground? The sea is presumably still filling up; it might be foolish to stray too far just yet, unless they know they won't be trapped. The IPad with the maps has gps, so likely yes. NetWeasel wrote: Edit: Also, Megan's got the map. I wonder if we might get a look at it. I'm guessing no. I'd like a look at it too, but suspect we won't see it. But the map is suddenly a lot less useful, since it mostly describes the newly wetted sea floor. Our crew seems to have no tools for dead-reckoning while drifting, and can't keep track of landmarks after they are submerged. They probably have only the vaguest guess as to where they are currently. Last edited by charlie_grumbles on Fri Jul 26, 2013 4:45 pm UTC, edited 1 time in total. Most likely, to keep people from guessing & hammering the server. Huh. I have posted exactly 1% of all posts on the OTT. BlitzGirl wrote: Molpy up! 2000 posts, yay! TimeLurker wrote: I'd like to see Bruce Willis as Cueball. The age is all wrong though. Can we get a young Bruce? This is actually Sandcastle 3.0 (they had a little one at Lucky's cabin). and nothing will make the Loopists happy (they'll have to watch forever to make sure it is an actual loop and nothing changes from on iteration to the next). Per Decree: Do you think we'll see La Petite again? Random832 wrote: As I understand it, they can't be downloaded from the server until the ONG anyway, ...? Is this true? How can we know this if the filenames are hashed? How can we possibly guess a correct filename to see if you can download it before the ONG? Whizbang wrote: I don't see coffee, though. But, maybe it is just too weak to be seen (i.e. too close to water) ? Last edited by hajo on Fri Jul 26, 2013 4:54 pm UTC, edited 1 time in total. Yes, but have you done it while the coastline was changing? 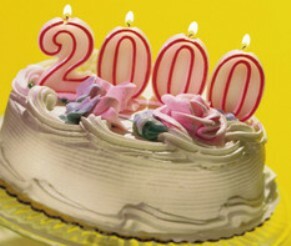 @BlitzGirl: Happy 2000! Boy these numbers go by fast in the OTT. It's almost like the sea is rising! taixzo wrote: Huh. I have posted exactly 1% of all posts on the OTT. Can you keep up? Happy five hundred! ⁴² ottification, mikro2nd! And taixzo, a truly sea¹ish one, in more than one way! Happy 2000th, BlitzGirl! 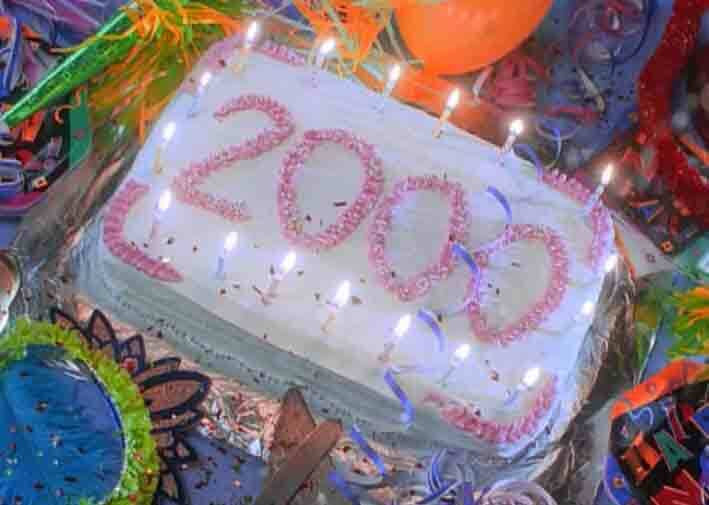 I don't really ‘do’ centennial cakes anymore (plenty of people are, so no huge miss), but I'll make an exception for the 2000th. And happy 50,000th to us all! And jay, we're on land! With new ⁷trees! Can't wait to find out what happens now. Last edited by mscha on Fri Jul 26, 2013 4:53 pm UTC, edited 1 time in total. NetWeasel wrote: Megan's got the map. I wonder if we might get a look at it. I'm guessing no. Last edited by Zorin_75 on Fri Jul 26, 2013 5:01 pm UTC, edited 1 time in total. But, maybe it is just too weak to be seen ? Yeah, but the sea is obviously not made of coffee. The first thing they did when they joined rafts is to build a shelter and fall asleep. Maybe the sand is coffee, though. Megan was playing with the sand and was up before anyone else, or maybe all night. Why do they have little tables covered in sand? It's part of the ritual to change the java script. BlitzGirl wrote: I wonder if all of the Forty are going to exit the raft, or just a few of them. I'd like to see LaPetite again soon. There you go, she's scampering on ahead! Last edited by Random832 on Fri Jul 26, 2013 5:05 pm UTC, edited 1 time in total. TOM SERVO: What's that thing in your hand? NetWeasel wrote: CUEBALL: Where do you think we are? It's a piece of the Sampo, obviously. Hmmm...eventually the western part of the Mediterranean will start to overflow past Sicily and into the eastern part of the Mediterranean. At that point the sea level in the western part, where the Cueganites are, will stay constant for a while until the eastern half of the Mediterranean catches up. Could that be what's happening now? Last edited by Charm Quark on Fri Jul 26, 2013 5:09 pm UTC, edited 1 time in total. Last edited by mscha on Fri Jul 26, 2013 5:12 pm UTC, edited 3 times in total. Ah, I miss 'ol Tom. But seriously, they have a big decision to make right now. If this is an island, they need to get back on the raft and stand ready to pole away from the trees. If not, they need to offload whatever supplies are worth carrying and head uphill, possibly RUNning. 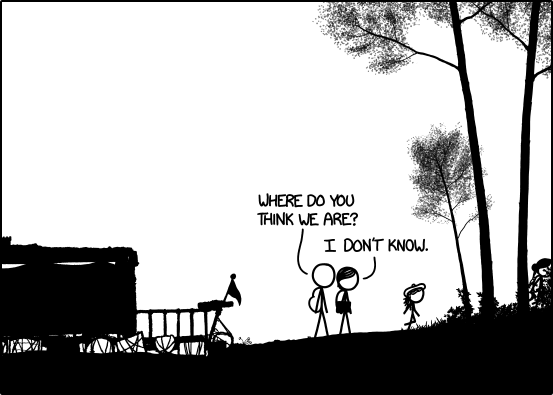 I wonder if "..." reflects this uncertainty. Maybe the previous instance of "..." was mustard (the plan might have been to go directly from Wait For It to RUN). What they should do in case flooding resumes is have someone stay with the boat with a rope to keep the boat near the shore by walking it up, rather than tying it to anything (which could result in it being tied to a submerged point) or simply leaving it. Last edited by Random832 on Fri Jul 26, 2013 5:12 pm UTC, edited 1 time in total. Also did you guys notice they don't know where they are? Last edited by TimeLurker on Fri Jul 26, 2013 5:15 pm UTC, edited 1 time in total. Coastal navigation doesn't depend on the immediate shore, but on things that can be seen above the shore. Tops of hills, IRL lots of manmade things like water towers, etc. If you can orient the map to the terrain you are in pretty good shape. A compass helps, of course, but that is actually a possibility here. And note that they have lots of terrain above them all across the North. But of course this has become moot given the latest frame.